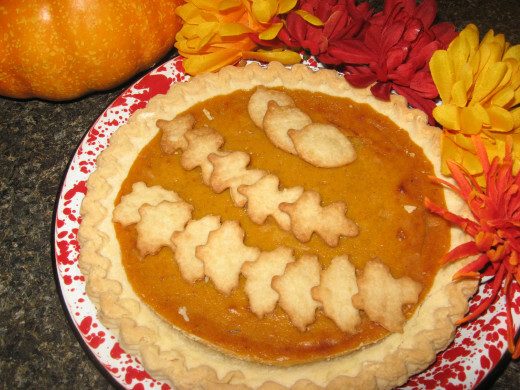 Pumpkin recipes are wonderful Thanksgiving ideas! I’m always surprised that more people don’t take of advantage of the autumn bounty, especially when you can find pumpkins that were locally grown. Oh sure, many Americans use pumpkins as part of their fall decorations, but too often, the “punkins” never find their way onto the table. What a shame! They’re a lot more versatile than you might think. Although they’re mostly used with Thanksgiving dessert ideas, pumpkins can also be used in soups and into appetizers like dips and savory spreads. Pumpkin flesh actually works well with sweet dishes and with savory dishes. It can be roasted and served as a vegetable, like you’d do with butternut squash or acorn squash. And, of course, even the seeds can make healthy, delicious snacks. I hope the following Thanksgiving ideas will give you some of your own. Sometimes you just need to get a few suggestions to get your gears to turning. If that doesn’t happen, I hope you enjoy making some of the pumpkin recipes I’m sharing here! There are several different pumpkin varieties, ranging in color, size, and shape. 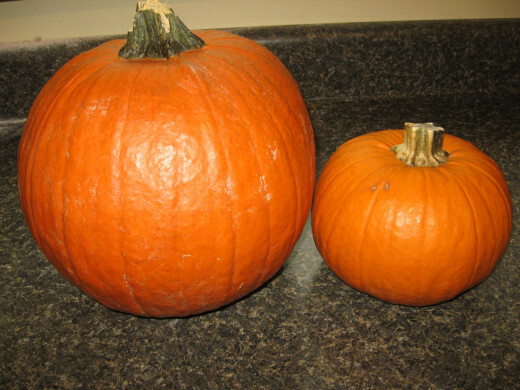 Some are as small as two pounds when mature, while the jumbo pumpkin varieties might reach weights in excess of 100 pounds. The fruits can be yellow, red, orange, white, dark green, striped, light green, gray, or golden tan. You don’t need to know all about the different types to be a successful pumpkin cook. 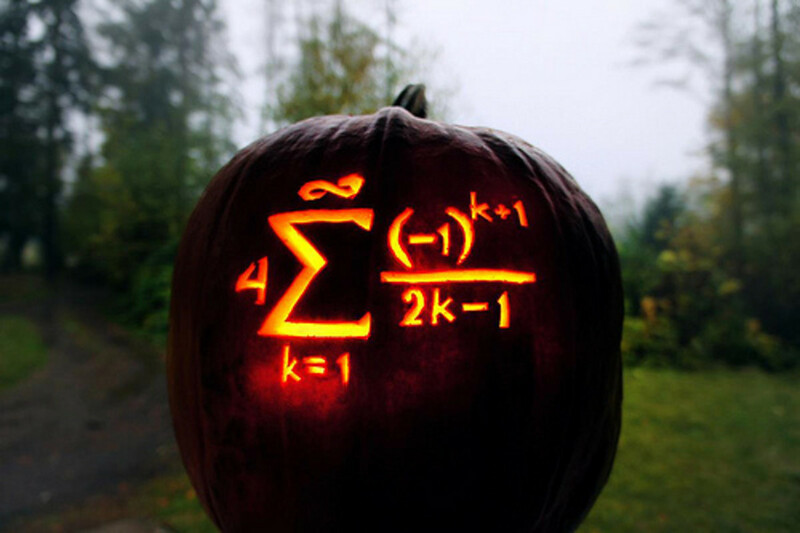 Your main objective is to be able to distinguish between field pumpkins and pie pumpkins. Generally speaking, the large orange fruits used to make jack o’lanterns are often described as “field pumpkins.” These aren’t the best for cooking – especially for pies. Instead, you’ll want to use a pie pumpkin, also called a “sugar pumpkin.” You can make pies with the big fruits, but from my experience, they won’t be anywhere near as tasty, and the texture won’t be as nice, either. Make sure the pumpkin you buy is labeled as a pie or sugar pumpkin. Choose firm pumpkins that lack any soft spots or deep blemishes. If you’re wondering how to cook pumpkin and turn the golden globes into yummy dishes, I’ll tell you. I’ll also show you with the pictures I’m posting. Cooking pumpkin can be done in several ways. It can be done in the microwave, in the oven, in a steamer, or in a regular pot. Roasting the fruits in the oven or microwave are probably the easiest methods, but that’s not how I do it. I simmer mine in water on top of the stove. Why? 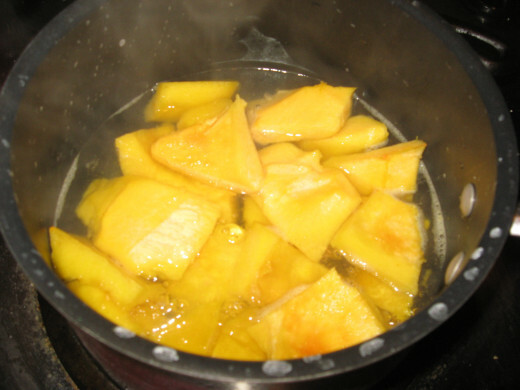 I’ve tried cooking pumpkin all different ways, and I just prefer the stovetop method best. To me, the flesh has a better texture, and I think it even has a slightly better flavor. Maybe it’s all in my mind because I went to more trouble. Anyway, back to how to cook pumpkin. Rinse the pumpkin well. Cut it in half, thirds, or quarters – whichever is easiest for you to handle. Use a large spoon and scoop out all the seeds and stringy material. Save the seeds to toasting or roasting. 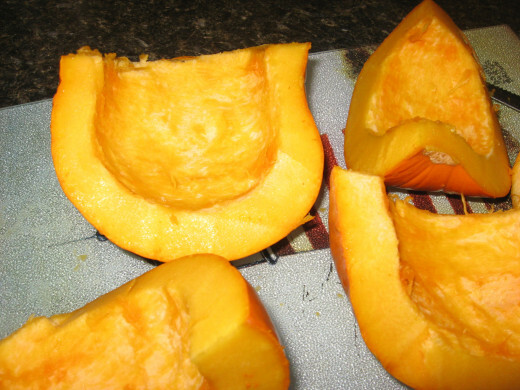 Now cut the cleaned pumpkin sections into smaller sections or cubes. You can slice off the peel, if you like, but it’s usually easy to remove once the pumpkin has cooked. Place the cubes in a pot and add water. The water should almost cover the pumpkin. 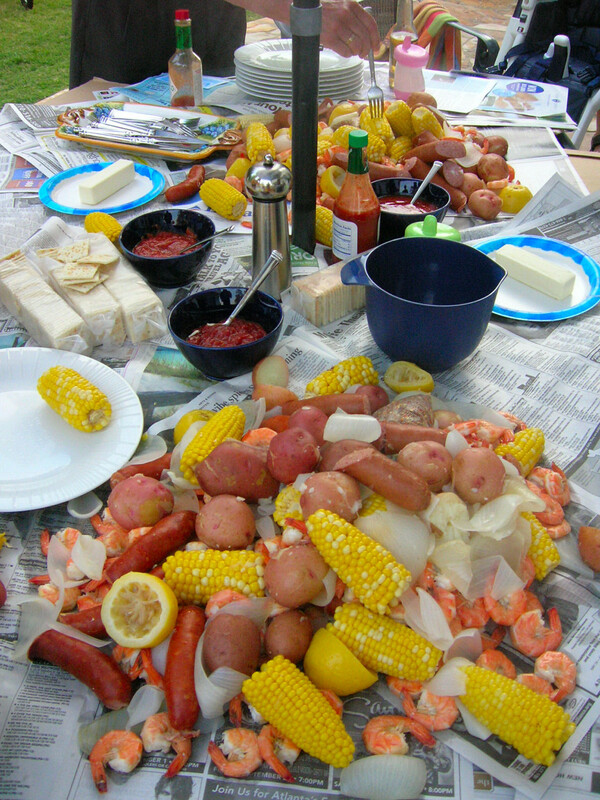 Bring pot to a full boil and reduce heat to simmer. Cover pot and cook until flesh is very tender. Pour into a colander to drain for a few minutes. Line a large bowl with several thicknesses of paper towels and add pumpkin in order to remove more water. 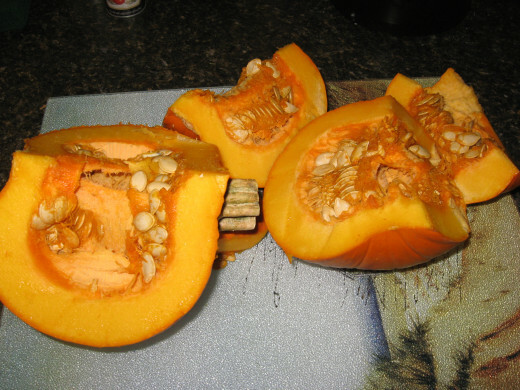 When pumpkin flesh is relatively cool – cool enough to handle - pull off peel and stir through the pulp with a fork and remove any tough or long fibers. Add pulp to a blender, food mill, or food processor and puree to desired consistency. I like a really smooth pumpkin puree, by the way. For just a moment, let’s talk about easy pumpkin recipes. You’re undoubtedly familiar with canned pumpkin. This has already been cooked and pureed, so it’s ready to use in recipes. You can also buy pumpkin pie filling, which has already been sweetened and seasoned. Many people get the two confused, but they’re actually very different. Sure, cooked pumpkin is in both, but the similarities stop there. Canned pumpkin is just that – and only that. 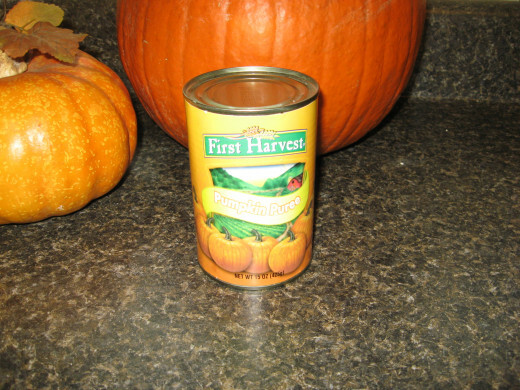 Most brands of canned pumpkin contain nothing but pumpkin puree, without salt or sugar. On the other hand, canned pumpkin pie filling contains salt, sugar, and spices, often including cinnamon, cloves, ginger, and nutmeg. 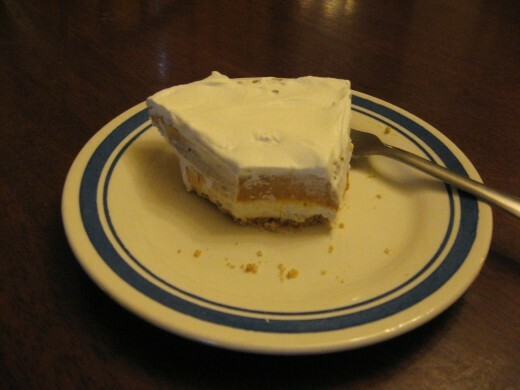 To make a pie with the filling, you only have to add eggs, milk or evaporated milk, and a pie crust. There are lots of no-bake easy pumpkin recipes you can make from both types of canned pumpkin. The pumpkin puree is combined with Cool Whip, instant pudding, and/or cream cheese, in many cases. These ingredients give the pumpkin a milder flavor and a texture you’d expect to find in a pie or pudding. Although I prefer using “real” pumpkin in my recipes, I like to keep the canned version on hand for quick and easy desserts. Pumpkin soup is rich and creamy – almost velvety. Not everyone likes it, however. I think it might be an acquired taste. That could be because most Americans associate the taste of pumpkin with desserts. If you can overcome that bias, however, you might find that you really like pumpkin soup. It varies from cook to cook and from country to country, and my pumpkin soup recipe includes curry powder, which adds a wonderful flavor. Directions: Melt butter in a Dutch oven and cook onion until soft. Add garlic and cook for one minute. Stir in remaining ingredients and puree in blender or food processor. Return soup to Dutch oven and bring to slow boil. Immediately reduce heat and simmer for about 30 minutes. Serve with a sprinkling of paprika, crushed red pepper, or parsley. I’ve used many, many Thanksgiving dessert ideas over the years. I love Thanksgiving – probably because I enjoy cooking so much. I also enjoy feeding people, so the holiday is a perfect fit for me. I’ve been hosting large Thanksgiving dinners since I was in my twenties, and I’m still doing so. Everyone comes to my house for Turkey Day. I always include the traditional Thanksgiving desserts with my feast, including pumpkin pie, pecan pie, and sweet potato pie, but I often add another dessert or two. Sometimes these are in keeping with tradition, but sometimes they’re not. In the South, many cooks serve cakes with their feasts, in addition to the pies. 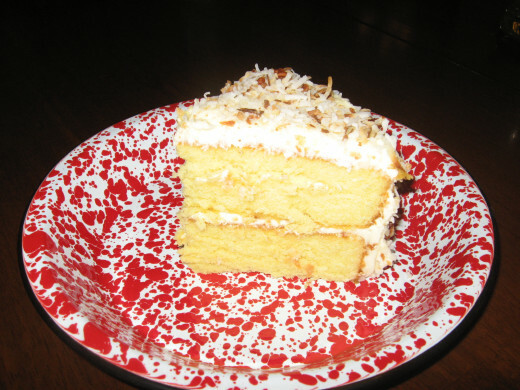 The most popular are caramel cake, carrot cake, red velvet cake, and Italian cream cake. One of the best is a cake my aunt makes. It has about twelve skinny layers, with lots of chocolate fudge icing between each layer. Other add-on desserts I’ve served for Thanksgiving have included banana pudding, dump cake, coconut cake, apple cake, apple pie, blueberry pie, strawberry pie, and a variety of cheesecakes. If you want to really think “outside the box” and do something unexpected this year, I have a few Thanksgiving dessert ideas you might like. How about cheese, fruits, and a nice dessert wine? Or port and dark chocolate? You could always go international and serve flan, crepes, Black Forest cake, or crème brulee, too. You might even want to look to America’s British connection and serve a flaming plum pudding, or you could go back to the Native Americans and serve corn pudding sweetened with honey. If you’re having guests over for Thanksgiving dinner, you want your food to be delicious, and you want it to be attractive, too. 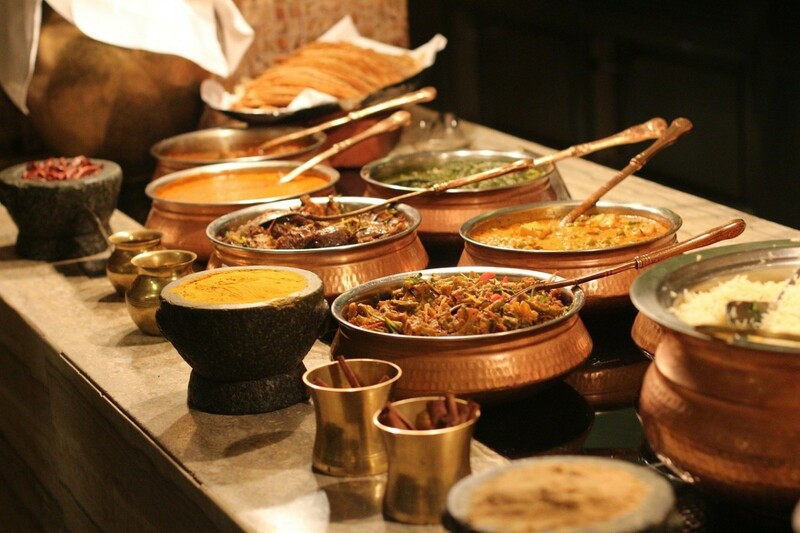 Part of the appeal of food is the visual presentation, which you can enhance with food garnishing. These don’t have to be complicated to be attractive, and you can include some edible garnishes and some inedible ones. For pumpkin pies or other pies, for example, you can place the pie plate in a plate that’s slightly larger and surround the dessert with some colorful silk mums. You can make easy rosettes with canned whipped cream, and softened and sweetened cream cheese also makes a nice garnish for pumpkin pie. 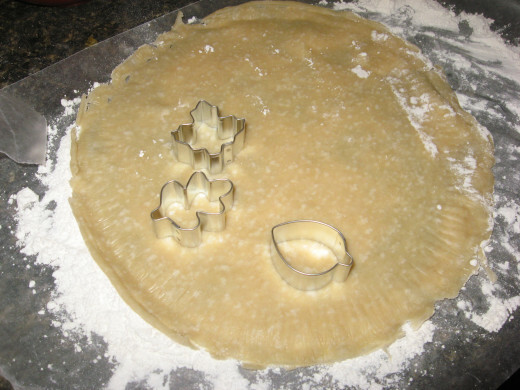 Just spoon the cream cheese mixture into a pastry bag and make the designs you want. Small pumpkin candies also make great garnishes for Thanksgiving desserts. Pastry garnishes are easy and fun to make, and they can be used on practically any baked pie. 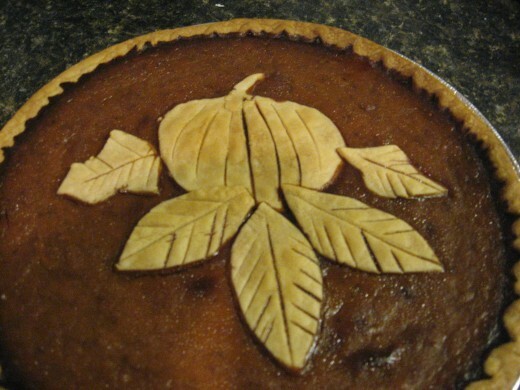 Roll a pie crust out thin on a floured surface and use a sharp knife or kitchen scissors to cut out simple shapes like leaves, pumpkins, or acorns. Small cookie cutters work great here, too. 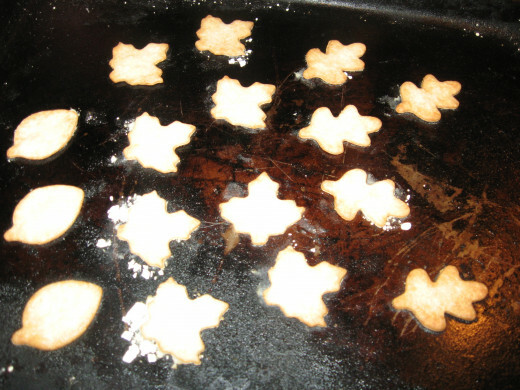 Once the shapes are made, transfer them to a lightly greased cookie sheet and bake at 400 until they’re light brown. For extra fancy garnishes, you might want to dip the pastry shapes in chocolate. How many pumpkin pie recipes do you have? Well, you’re about to get three more. Pumpkin pie is one of my favorite Thanksgiving desserts. Actually, I like it any time of year, and I don’t need a special occasion to enjoy it. 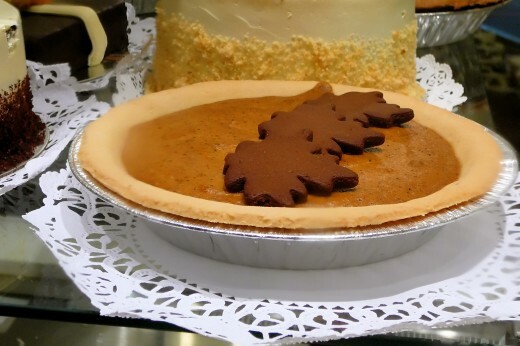 The flavor of traditional pumpkin pie can be enjoyed in ice creams, ice cream cakes, pound cakes, cheesecakes, trifles, tortes, custards, brownies, cookies, and puddings. I’ve even seen a few beverage recipes that included pumpkin and spices. Even if you use pretty ordinary pumpkin pie recipes, you can tweak them to make them more unique. You might want to add raisins, chocolate chips, chopped nuts, coconut, crushed pineapple, or butterscotch chips to the filling. You can change the overall taste of the pie by using a different crust, too. One of the best I’ve tried has chopped pecans in it. With that pumpkin pie recipe, the crust is almost as tasty as the filling! I learned how to make pumpkin pie when I was a teenager. Making a good pie doesn’t have to be difficult, but it can be. If you’ve never had experience with cooking pumpkin or with making pumpkin pies from canned products, I suggest you begin with a few easy pumpkin recipes or with an easy pumpkin pie recipe. These will give you a good idea of how the texture of the pumpkin flesh should look and feel. After gaining a little experience, you’ll probably want to try a pumpkin pie from scratch. Of course, you’ll most likely be following a recipe to start with. One thing I’d like to point out to you is to be careful with the seasonings. Some people don’t like to include too many different spices or too much of a single spice because they feel that the natural flavor of the pumpkin flesh can be overwhelmed. I don’t really follow this school of thought. I like the spices! I will say, however, that I often use less spice when I’m making pumpkin recipes with puree that I’ve made myself. When I use canned pumpkin, I use more spices, in most cases. If you’ve never made a pie crust, I suggest using a pre-made frozen pastry for your first pumpkin pie. It’s pretty much foolproof, so your pie stands a better chance of turning out well. Once you get the basics down, you might want to do some experimenting on your own, with different crusts and different ingredients in your pie fillings. Have you ever made a pumpkin pie from scratch? If you haven’t, you’re missing a real treat. Will you be able to tell the difference in a pumpkin pie recipe that uses real pumpkin instead of canned pumpkin? You betcha! Is it really worth all the fuss? It is for me, but it might not be for you. I’m a foodie and have a real appreciation for yummy flavors, so oftentimes, I don’t mind the extra work if it means tastier foods. You owe it to yourself and to your family to make a pumpkin pie from scratch just once. 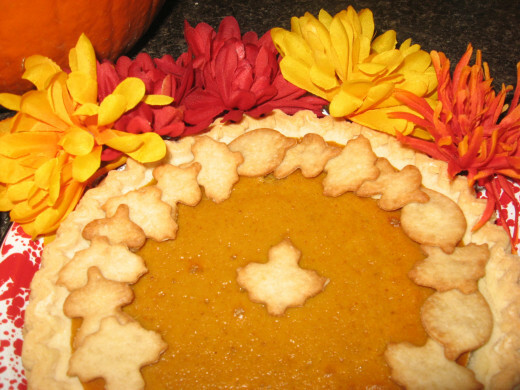 If it doesn’t meet your expectations, you can always go back to your easy pumpkin pie recipe made with canned pumpkin. For this, you’ll be using pumpkin puree that you made in your own kitchen. I’ve already told you how to cook pumpkin and turn it into puree. Once you have that completed, the hard part is done, and you’re well on your way to a delicious pumpkin pie! In a small bowl, combine sugar, brown sugar, spices, and salt. Set aside. 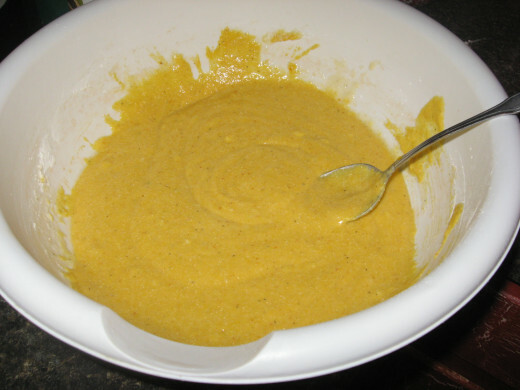 In a large mixing bowl, beat eggs while gradually adding sugar mixture, pureed pumpkin, and butter. When eggs, pumpkin, butter, and sugar are combined, slowly pour in evaporated milk, while stirring. Turn custard into pie shell. Bake for 15 minutes, then reduce oven heat to 350 degrees. Continue baking for another 50 minutes, or until filling is set. 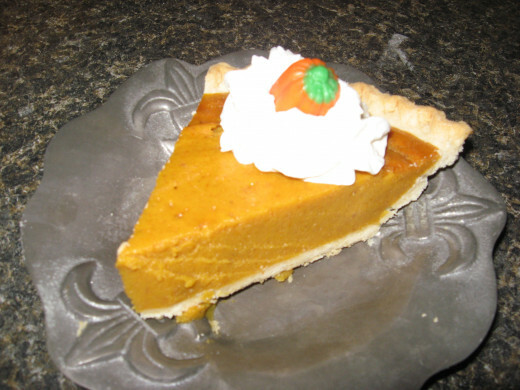 This is a very easy pumpkin pie recipe that you can whip up in no time. It’s made from canned pumpkin, so you won’t have to cut, scoop, peel, cook, and puree the flesh yourself. 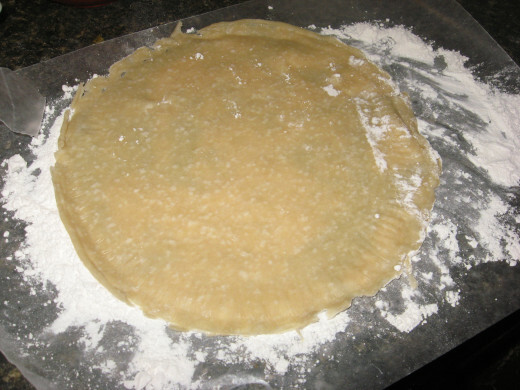 Just open the can and combine it with the other ingredients, pour it into a pastry shell, and bake it. Just make sure you buy canned pumpkin instead of pumpkin pie filling. Directions: Preheat oven to 425. Beat all pumpkin pie ingredients together and pour into pastry shell. Bake for 15 minutes. Reduce heat setting to 350 and bake for about 40 more minutes. Two of my daughters don’t consider it a proper Thanksgiving if I don’t make a no-bake pumpkin pie. In fact, I almost always make two or more, and they all get consumed. These are very quick and easy desserts, especially if you use the freezer for the chilling process in between the different layers. Directions: Place cream cheese in a glass or plastic mixing bowl and soften in microwave. Add cup of topping and sugar and beat until smooth. Spread half of mixture on one crust and half on the other. Chill until firm. Beat pudding mixes and milk together. Add in canned pumpkin, brown sugar, spices, and salt. Divide mixture over firmed cream cheese layer in pie shells. Place pied in freezer for a few minutes for pumpkin layer to firm, then spread on a layer of Cool Whip. The grandkids love these pumpkin bars! I must admit, I’m sort of partial to them, too. 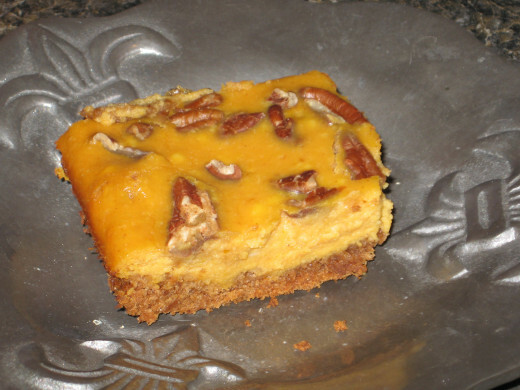 This pumpkin bar recipe combines the smoothness of pumpkin with the crunch of pecans. Be careful – I’ve found that these things are addictive! Directions: Preheat oven to 350 degrees. Butter a 13 x 9 glass baking dish. Combine 2 ½ tablespoons melted butter and cake mix. Add one beaten egg to make crust. Spread mixture in bottom of baking dish. Beat together 2 eggs, pumpkin puree, condensed milk, and cream cheese. Add sugar, spices, and salt. Spread evenly over crust. Top with nuts, if desired. Bake for about 40 minutes. Cool slightly and firm in fridge for easy slicing. Cut into squares or rectangles. 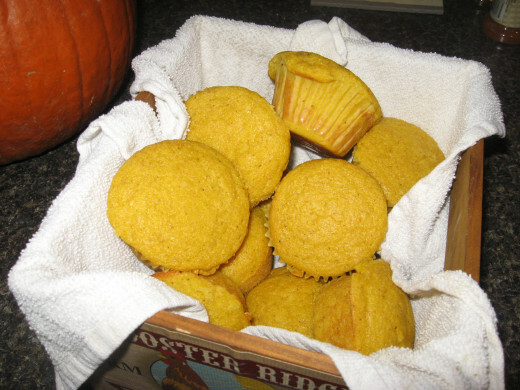 If you have a drop of southern blood in you, you’ll love this pumpkin muffins recipe. That’s because my version is actually pumpkin cornbread. I made this type of cornbread for the first time after seeing one of my favorite movies, Midnight in the Garden of Good and Evil. The film was made in Savannah and represented many southern customs and traditions, including Low Country cooking like pumpkin cornbread. 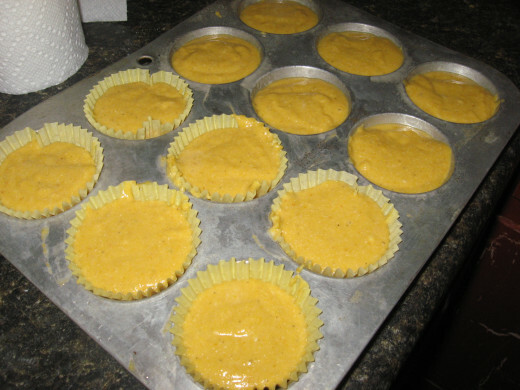 Before the movie came out, I’d sampled the pumpkin version of cornbread before, but I’d never made it myself. When I saw pumpkin cornbread being served at a holiday gala in the film, I was reminded that I’d always wanted to make the bread at home, so I did. Rate my Pumpkin Muffins! Thanks! 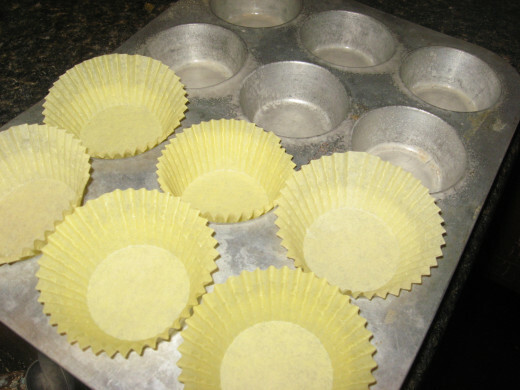 Spray a 12-cup standard muffin tin with Baker’s Joy cooking spray OR use cupcake liners. 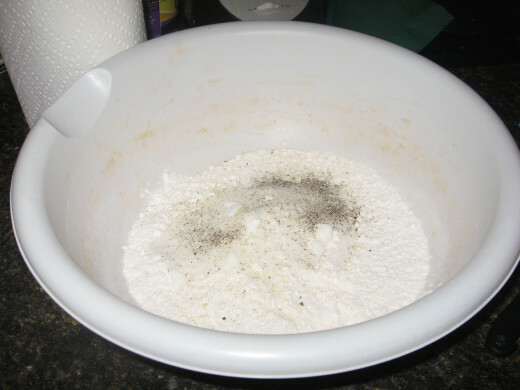 In a large mixing bowl, combine cornmeal, flour, sugar, garlic salt, and black pepper. Add milk, while stirring. Blend in pumpkin, egg , and oil. Divide batter evenly among the twelve muffin cups. This pumpkin bread recipe is easy to make, and it’s really good. I sometimes serve it with Thanksgiving breakfast, but it’s great for snacking, too. You can also use it for Thanksgiving desserts. Top it with ice cream, whipped cream, caramel sauce, or cooked peaches or apples. Directions: Preheat oven to 350 degrees. Spray a loaf pan with Baker’s Joy. In a mixing bowl, combine flour, sugar, and salt. In another bowl, beat together pumpkin, oil, melted butter, eggs, milk, cinnamon, vanilla, ginger, and nutmeg. Add dry ingredients and mix just to moisten. Add nuts, if desired. Bake for about an hour. When pumpkin bread is slightly cool, turn out onto plate or platter. 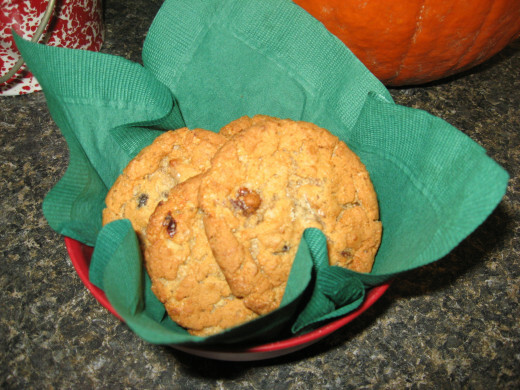 These pumpkin cookies are always a big hit with the grandkids. They’re soft and chewy, but if you like crunchy, crispy cookies, cook them for a minute or two longer. I like my pumpkin cookies with raisins, but you might not. You might want to add chopped nuts, instead. Directions: In a large mixing bowl, combine flour, oats, baking soda, cinnamon, ginger, and ground cloves. 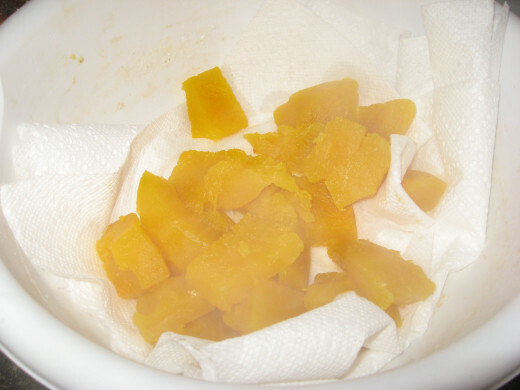 In a different bowl, mix together the white sugar, the brown sugar, the oil, the pumpkin, and the vanilla. Gradually add the flour mixture to the pumpkin mixture. Don’t mix any more than you have to. Add raisins, if desired. Drop spoonfuls of dough onto a greased cookie sheet, about one inch apart. I usually butter my hands to mash down the cookies before baking. This pumpkin cake is super easy to make because it requires no cooking. It’s just pumpkin filling, cookies, and Cool whip. That’s it! I’ve used ginger snaps and sugar cookies, and I prefer the ginger snaps because they make the cake extra spicy. Hubby, however, likes the sugar-cookie version better. Wimp! You can make this cake in just about any size you want, but I’ve found that a rectangle works best, sort of like a loaf. I use 32 cookies, making the cake four cookies wide and eight cookies long. You’ll need just three ingredients: the cookies, a can of pumpkin pie filling (NOT canned pumpkin), and a large container of whipped topping, like Cool Whip, but the store brands work just as well. Spread the pumpkin filling between the cookies and put the cookies together in the configuration you want. Cover the whole thing generously with the whipped topping. Make a loose foil tent over the icebox cake and leave in the fridge overnight. When you’re ready to serve the cake, it works best if you slice it at an angle. Believe me, when it comes to easy pumpkin recipes, this is just about the easiest one you’ll find. You’ll need to assemble the cake on the platter you want to use for serving. The cake will be hard to transfer. This pumpkin cake recipe is sort of like a pound cake that includes pumpkin puree. 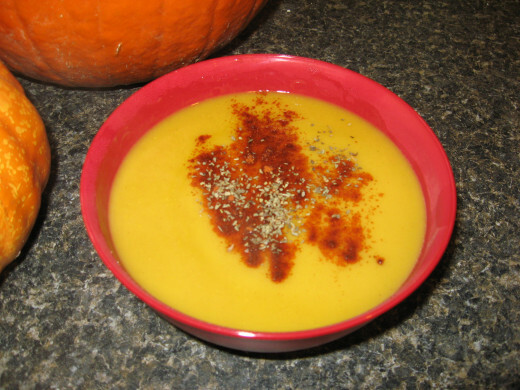 As with most of the other pumpkin recipes I posted here, you can use puree that you made yourself, or you can use canned pumpkin. 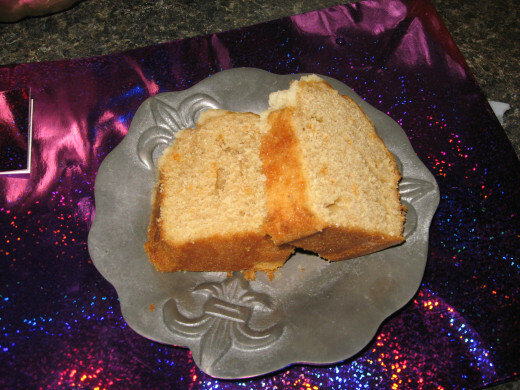 Like most any good pound cake, this pumpkin cake is moist and dense, with a yummy crust. You can use a tube pan or a Bundt pan. Directions: Spray a Bundt pan or tube pan with a generous amount of Baker’s Joy. Preheat oven to 350 degrees. In a medium sized bowl, mix together flour, cinnamon, baking powder, baking soda, salt, ginger, and cloves. Add butter and sugar to a large mixing bowl and cream together with mixer. 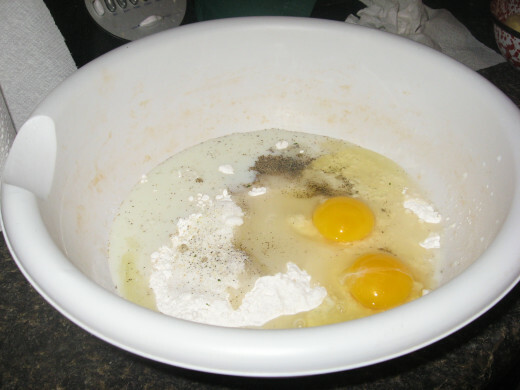 Add one egg at a time, while continuing to mix. Fold in pumpkin puree. While beating at low speed, add a little milk and a little of the combination of dry ingredients, alternating between the two until entire amounts are used. Turn batter into pan and bake for about one hour. 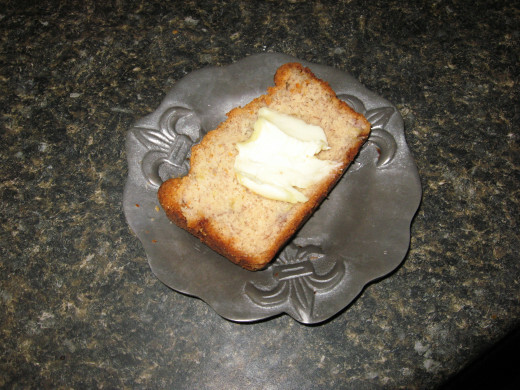 After cake has cooled slightly, place a plate over pan and invert so that cake transfers to plate. Sprinkle with light brown sugar, if desired. 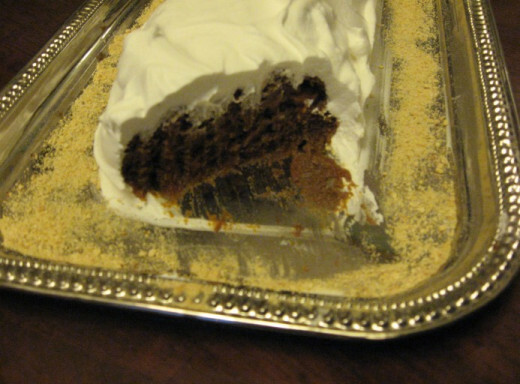 This pumpkin cake is great with whipped cream or soft cream cheese spread. Umm. Pumpkin cookies, bars and cakes. I will have to try some of these soon...You gave a lot of delicious sounding recipes. Thanks bunches! I love pumpkin! Thanks for the recipes. Awesome video. Very helpful and informative. Loving the pumpkin time of year! Wow - thanks for all the yummy recipes. My favorite season is fall - because I get to eat pumpkin! It is my favorite food. Reminds me of growing up, visiting my grandparents and enjoying pumpkin pie with piles of real whipped cream. Everything pumpkin! It's that time of year again. Great video. If fall brought no other goodies but pumpkins it would be heaven. BTW - wild persimmons in Indiana are another incredible fall treat. Almost made up for everything else. hehe. I'm anxious to try the soup and the muffins! Years ago, I tasted a heavenly pumpkin soup at an elegant restaurant, and I still remember how delicious it was. It was savory, with a hint of the spices we use in pumpkin pie. And it was oh-so-good! I would love to have an invitation to your Thanksgiving day dinner! I think it is the sweetened condensed milk that caught my eye. I could that out of the can. Lots of excellent ideas for pumpkin. 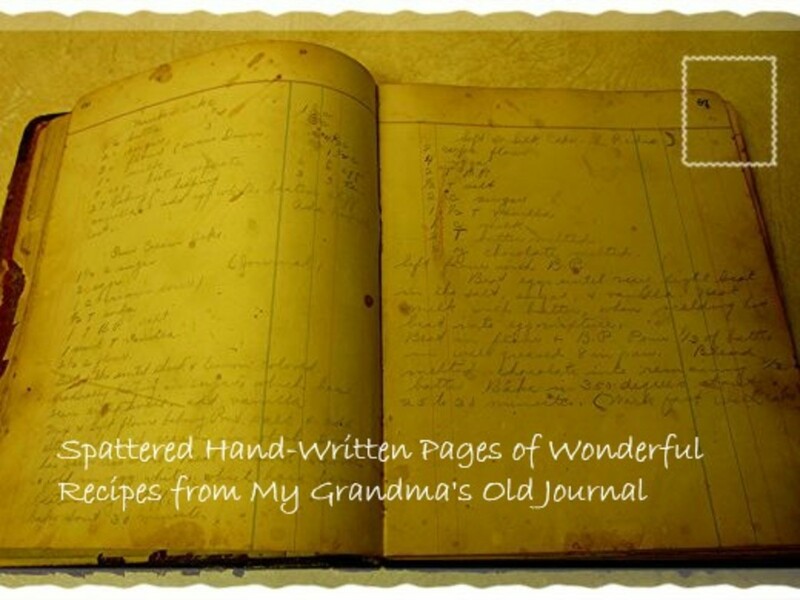 Thanks for sharing all these great recipes. Voted UP. and will share on pinterest.